It's time for an update on real estate market conditions in Louisville, CO. The following analysis is based on data through the end of February, 2014. To receive my regular research report, subscribe to House Einstein research. Click HERE. As with other parts of Boulder County, the big story remains the inventory shortage. 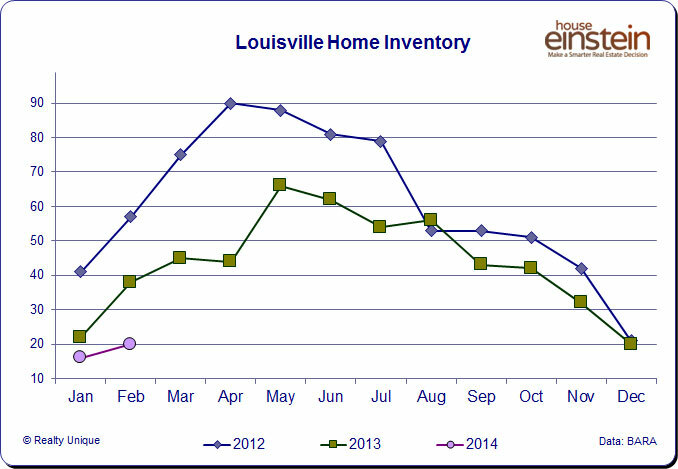 Only 20 houses were on the market in Louisville last month, down 47% from the same period a year ago. 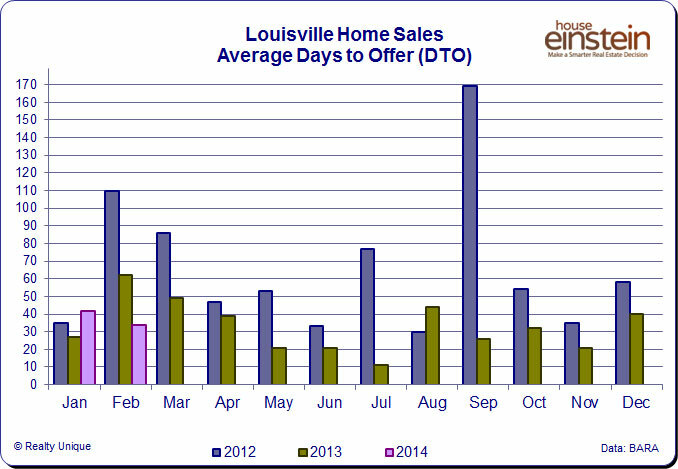 10 homes sold during the month of February, 11% more than last year. 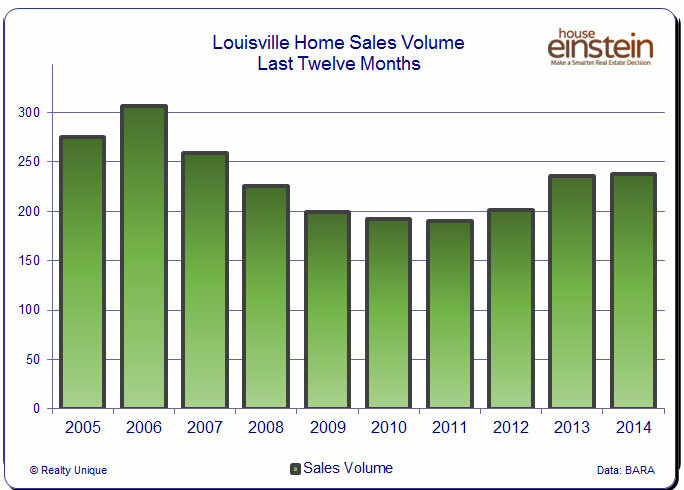 In a small market like Louisville, month to month activity can be quite volatile. It's important to look at longer periods of time to get a sense of the real trend. 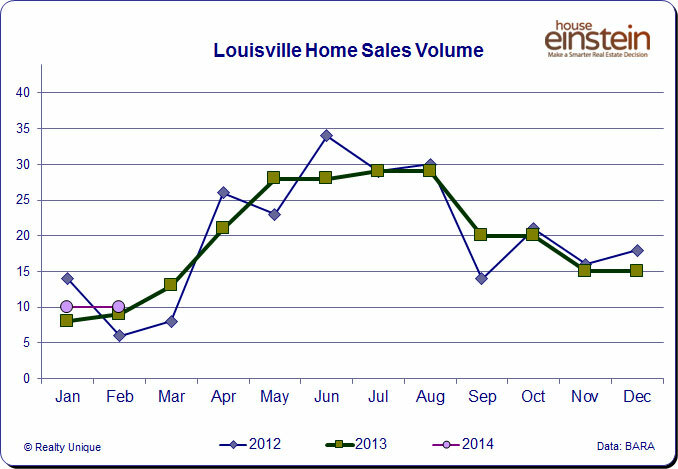 90 homes sold during the past six months (ending in February), a 5% increase from the same period a year ago. Over the last twelve months, 238 homes sold. Up 1% from a year earlier. 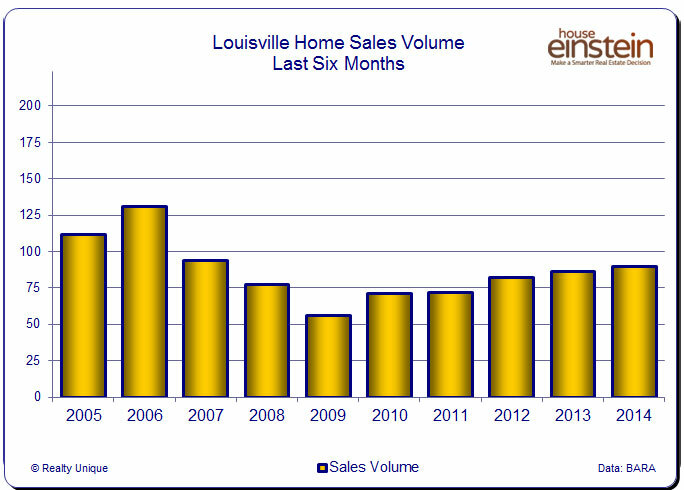 Note that sales volume remains well below the peak of 2006. The average days to offer fell to 34, the lowest February reading since I've been tracking. Keep in mind that desirable properties have been going under contract almost immediately. It's important to see houses as soon as they'e listed for sale. 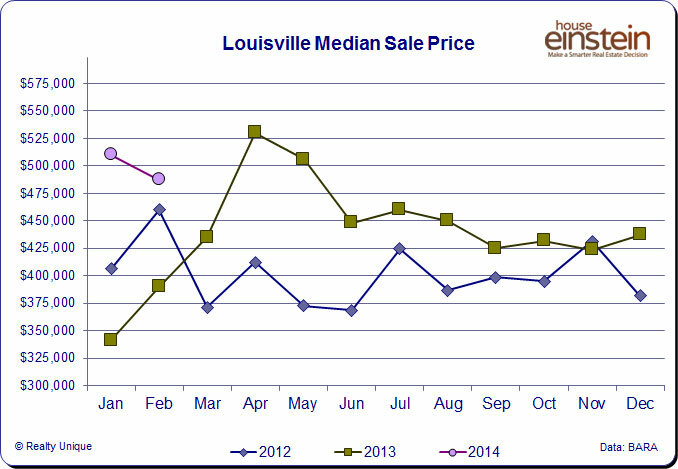 The median sale price during February was $487,500. 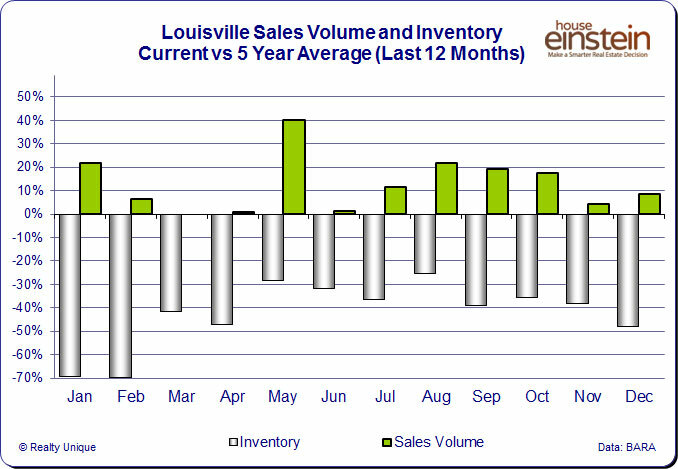 Absorption is the percentage of sales relative to the previous month's inventory. It's an indication of liquidity. Absorption reached 63% last month, the second highest month since I've been tracking the data. Current absorption levels are 3x the long term average for February of 20%. This is my favorite chart of the series. 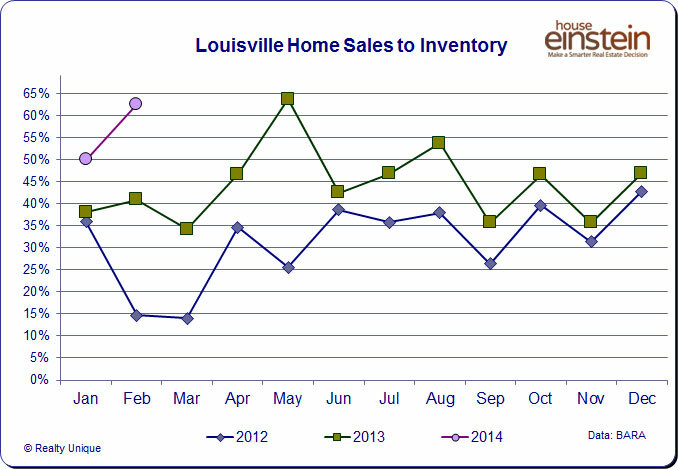 It shows the most recent sales and inventory compared to the long term average. At a quick glance you tell how the market "feels" to participants. As we begin to enter the busy selling season, inventory is running a shocking 70% below the long term average while sales volume remains slightly elevated. I hope you've enjoyed this analysis. If you're considering buying or selling real estate in Louisville, or elsewhere in Boulder County, and would like professional advice based on market conditions with a proven track record of client satisfaction, call me. 303.746.6896. I can help you make a smarter real estate decision.